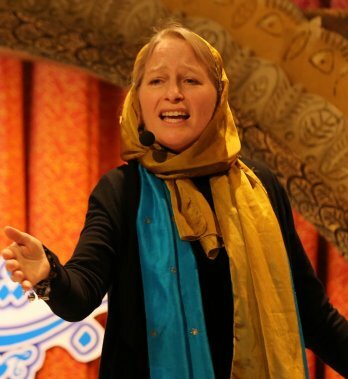 The Countess of storytelling has participated in numerous cultural activities and festivals throughout Quebec, Canada, the Caribbean, France and Iran, including a participation in the T.D. Canadian Children's Book Week. Her repertoire (for the young at heart of all ages) consists not only of traditional style tales, but also of her own creations, where reality and fiction walk hand in hand, and which are based on the reality of everyday life events, and on her own childhood in rural Quebec and in northern Canada. An English-speaking native of La Belle Province, she travels the globe, collecting and sharing her stories. Her Irish origins and her “undefinable” accent lend a certain uniqueness to herstories, a certain timelessness...to be discovered in both official languages. Her imaginative creations are often the first choice for the schools* where she presents her storytelling and creative writing workshops as part of the Culture in the Schools program. *(Where she has also worked as an assistant and helping students with learning difficulties). W.R.I.T.E.® Storytelling Workshops; Writing. Reading. Imagining. (Story)Telling. in English. Open the door to your Imagination- Focus on communication and creativity. Sharing of ideas and emotions through Storytelling may be used to stimulate interaction between generations, languages, cultures, and social classes, by opening lines of communication between people through their imagination. She is an active member of SC-CC (Storytellers of Canada), the RCQ (Regroupement du Conte au Québec) and ELAN (English-Language Arts Network).